Artist's concept of the close-orbiting alien planet Kepler-78b, whose scorching-hot surface is likely a huge ocean of lava. Astronomers have discovered a scorching-hot "lava world" whose year lasts just 8.5 hours and determined that another planet candidate with an even tighter orbit is likely composed almost entirely of iron. The newfound Earth-size exoplanet Kepler-78b is so close to its host star that its surface is likely an enormous ocean of lava, researchers said. Further, the discovery team was able to detect light emitted by the planet — a first for a world so small. "Just the fact that it's able to survive there implies that it's very dense," Josh Winn of the Massachusetts Institute of Technology, a co-author on both papers, said in a statement. "Whether nature actually makes planets that are dense enough to survive even closer in — that’s an open question, and would be even more amazing." Both Kepler-78b and KOI 1843.03, which has yet to be confirmed by follow-up observations, were detected by NASA's planet-hunting Kepler space telescope. Kepler was designed to spot exoplanets by noting the tiny brightness dips caused when they pass in front of, or transit, their host stars from the instrument's perspective. Kepler did this work from shortly after its March 2009 launch until mid-May of this year, when a malfunction robbed the observatory of its precise pointing ability. NASA is now considering new missions for the prolific spacecraft, which has detected more than 3,500 candidate planets to date, with many more likely waiting to be pulled out of its massive dataset. While the original $600 million Kepler mission is primarily interested in finding potentially life-supporting, Earth-like alien planets, Winn and his colleagues searched specifically for worlds about the size of our own in extremely tight orbits. "We've gotten used to planets having orbits of a few days," Winn said. "But we wondered, what about a few hours? Is that even possible? And sure enough, there are some out there." Kepler-78b is such a planet, with a year about the length of a typical workday for people on Earth. The planet is 40 times closer than Mercury is to the sun — so close that researchers hope to measure its gravitational influence on the parent star, which in turn could help nail down Kepler-78b's mass. This has never been done before for an Earth-size alien planet, scientists said. 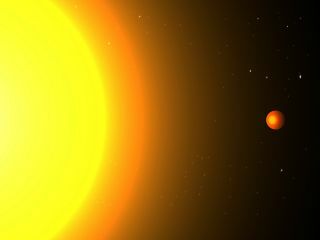 Temperatures at Kepler-78b's surface likely exceed 5,000 degrees Fahrenheit (2,760 degrees Celsius), making the world a poor candidate to host alien life. But some extremely close-orbiting planets may be potentially habitable, as long they circle the right type of body. Winn and his colleagues, for example, are now looking for worlds around brown dwarfs, strange objects that are bigger than gas giant planets but too small to spark the internal fusion reactions that power stars. "If you’re around one of those brown dwarfs, then you can get as close in as just a few days,” Winn said. "It would still be habitable, at the right temperature." The research team discovered Kepler-78b by noting the effects of its transit. But they also were able to detect the light given off by the planet itself, by measuring how much the overall light dimmed each time Kepler-78b disappeared behind its host star. The exoplanet's light is probably a combination of radiation from its hellishly hot surface and starlight reflected off lava and atmospheric gases, researchers said. The Kepler-78b discovery paper was published Friday (Aug. 16) in The Astrophysical Journal. The KOI 1843.03 study came out late last month in Astrophysical Journal Letters.